In the lead up to yesterday’s trade deadline, it was believed that the Atlanta Hawks would be able to auction off a few of their veterans to contending teams in need of players like Jeremy Lin, Dewayne Dedmon, or Kent Bazemore–even Taurean Prince’s name was tossed around in a couple of rumors. Yet, when the dust settled, only Tyler Dorsey was shipped out. For all of the activity around the league, the Hawks only made two trades. They acquired Shelvin Mack from the Memphis Grizzlies for the aforementioned Dorsey and took Jabari Bird from the Boston Celtics for a future second round pick (top-55 protected). Both Mack and Bird are expected to be waived by Atlanta; in order to take on both players before cutting them, Atlanta had to waive Daniel Hamilton. Once all of the transactions are finalized the Hawks will have a total of 15 players on their roster including two-way players Jaylen Adams and Alex Poythress. Depending on what the plan is–two-way players can only be with the NBA franchise for a total of 45 days maximum, Adams and Poythress have appeared in 10 and 18 games with the Hawks respectively–Atlanta could have potentially opened two roster spots heading into the back half of the season. However, Hawks general manager, Travis Schlenk made it known after the deadline that one of the big factors in Atlanta staying put at the deadline was the improvement the team has shown over their last 25 games (12-13 prior to the loss to the Toronto Raptors) as a driving force for keeping the team as is. 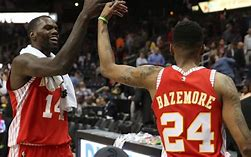 Bazemore let it be known that he wanted to remain with the Hawks and Dedmon is a big part of this team’s success. This rosy outlook post-deadline could quickly fade to black if the team watches some of the vets walk away for nothing this summer. It’s possible that teams didn’t value the Hawks assets in the same manner as Schlenk, getting draft capital should be priority number one as this team continues its rebuild. Schlenk mentioned that it is unlikely that they negotiate a buyout with any of their players unless they take a flier on a young guy or someone they really like and wants to be part of what they have going hits the open market.. Now that they’ve bought out Jeremy Lin, it’s possible the team the team looks to give extended tryouts to some young guys around the G-league. The rumors and intrigue of something new and different is part of the allure of the trade deadline, but in Atlanta no new faces will don Hawks across their chest this season. For fans and outsiders playing computer-GM or video game-GM is fun, ultimately, Schlenk decided that the status quo was what was best for the Hawks this season. What can Wesley Matthews bring to the Indiana Pacers?